Persistence Market Research in its new research report on the global refrigerated trailer gaskets market delivers value in terms of segmental analysis and forecasts on the global refrigerated trailer gaskets market across the various regional markets as well as from a global perspective. With the help of extensive research, our analysts have studied how different market dynamics are likely to impact the current and future scenario of the global refrigerated trailer gaskets market, thus providing useful insights to market players to plan their differentiating strategies capable of evolving with the changing market landscape with a view to achieve competitive advantage in the long run. We have analyzed the key trends, drivers, restraints and opportunities and their magnitudes across various regions in the globe while studying this sector. Impact analysis of key growth drivers and restraints based on the weighted average model are included in the report to better equip and arm clients with crystal-clear acumen and decision-making actionable insights. This report provides historical data of 2012-2016 along with value and volume forecast projections for the period 2017-2025 in terms of revenue (US dollars). It also includes detailed pricing analysis by type and the refrigerated trailer gaskets value chain analysis. In order to provide a comprehensive view of the market, we have included detailed competitive analysis and information on company players with unique selling propositions. The dashboard provides a detailed comparison of producers dealing with refrigerated trailer gaskets on parameters such as operating margin, unique selling proposition, collective market share, and geographic concentration. The study encompasses market attractiveness analysis of various segments of the global refrigerated trailer gaskets market. The report further indicates segment wise definition of the market along with its overall scenario during the assessment period. The publication focuses on identifying various opportunities in the global market and presents updates and insights associated with the various segments of the global refrigerated trailer gaskets market. In-depth analysis on average prices in US$/units have been considered for refrigerated trailer gaskets to arrive at appropriate market size numbers. Key market splits have been deduced from extensive surveys and primary research. A number of primary and secondary sources have been consulted during the course of the study. Secondary sources include company websites, company annual reports, white papers, and financial reports. Further deep diving has been carried out by interviewing various market observers and subject matter experts to get an actual picture of the global refrigerated trailer gaskets market. The data thus accumulated from these sources is revalidated using the triangulation method in order to gain near 100 percent accuracy that can enhance the credibility of the research. The data is scrutinized using advanced tools to garner qualitative and quantitative insights about the industry. Refrigerated trailers are thermally insulated temperature controlled food grade vehicles deployed with a sophisticated refrigeration unit. This trailer is dragged by a traction unit and can be used both for road and rail transportation. The refrigerated trailer gaskets are installed at the periphery of trailer body doors and vents. Our new research on the global refrigerated trailer gaskets market depicts a complete regional analysis of the global market. The report indicates that North America is expected to continue to be the leading market in the global refrigerated trailer gaskets market and this growth is helped by the increasing capital expenditure of third-party logistics businesses across the region. Truck trailers are major assets for 3PL businesses around the world. These trucks are constantly upgraded with the latest technologies to meet growing consumer demands and to improve operational efficiency. Large fleet owners operate refrigerated trailers for an average period of 3–5 years, after which new trailers are usually purchased. There’s also a rise in demand for new refrigerated trailers with the revised emission standards. Our analysis of this market highlights Asia Pacific and Europe as the upcoming lucrative regions in the global market with a high CAGR projected during the forecast period. The Europe market for refrigerated trailer gaskets is currently on an upward growth trajectory, owing to the need to expand the cold chain capacity in the region. Whereas in Asia Pacific, efforts to improve food preservation and transportation, lower food wastage and increase food safety as well as the prevalent government norms and industry standards are enabling emerging Asian economies such as India and China to create significant demand for refrigerated trailer gaskets. Latin America’s economy is on its way to be transformed with the increasing urbanization and growing middle class population density. This has in turn given a boost to the consumption of perishable products such as fruits, vegetables, meat and seafood. Increasing demand for perishable food is linked with the growth of the refrigerated trailers market and consequently the gaskets used in the doors and vents of these vehicles. However, Latin America is still not a strong economy as compared to the other regions. The refrigerated trailer gaskets market may find some hindrances in its growth. As compared to refrigerated vans and trucks, investment required for refrigerated trailers is significantly higher. Local players prefer refrigerated vans and trucks over refrigerated trailers due to their low production and transportation capacity. Cost of transportation of products through refrigerated trailers is comparatively higher than transportation through refrigerated vans and trucks. Due to their low production capacity, local manufacturers do not transport their products in bulk quantity and hence there is no major requirement for refrigerated trailers in the region. 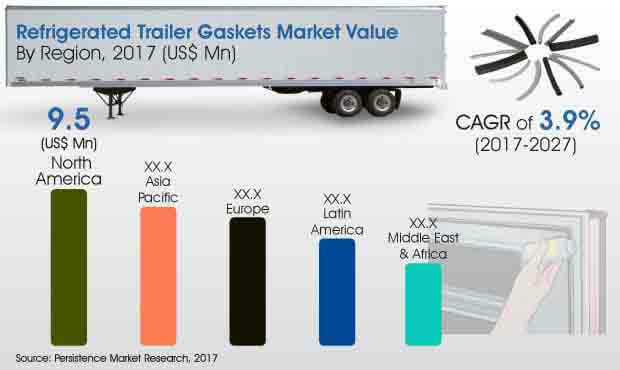 This can hamper revenue growth of the refrigerated trailer gaskets market. A rapidly expanding population has increased the consumption of frozen food and hence the refrigerator trailers that transport frozen food. However, with the skyrocketing technological advancements taking place in the industry, there is also a need for innovations in refrigerated trailers. To stay ahead of the competition, several manufacturers are focusing on implementing new technologies for refrigerated trailers as well as refrigerated trailer gaskets. Some of the major upgradations companies are looking to deploy include the adoption of more efficient strengthening processes, a wider product portfolio and long-term supply relations with key end-use industries as well as local manufacturers. Hebei Shida Seal Group Co., Ltd.